Due to its toughness, extensibility and high tensile strength, industrial sack kraft are designed to handle a pressure from high-speed filling and undesirable impacts from transportations and usages. It perfectly matches the needs of various industries including cement, animal feed, starch, and plastic pellet packaging industries. This brown sack kraft, made entirely of recycled and unbleached pulp , has superior toughness and high extensibility. It can withstands an impact from transportation excellently making it ideally suit for production of multi-ply sacks. Due to its exceptional toughness and high extensibility, this product produced with unbleached pulp is able to withstand impacts from transportation very well, making it suitable for multi-ply sacks manufacture. The brown kraft paper, produced with 100% virgin pulp, is a major material for multi-ply sacks requiring high tensile strength. With its smooth surface, it is truly suitable for high-quality printing. This white kraft paper is perfect for the production of multi-ply sacks. With high toughness, extensibility and tensile strength, it is highly recommended for packaging that needs beautiful printing to add extra value to products inside. 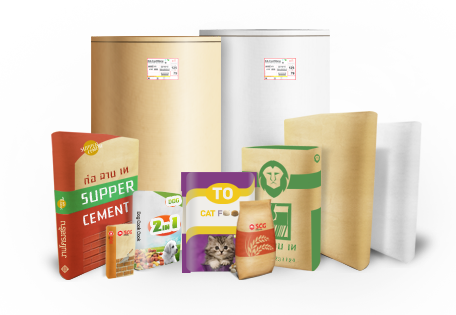 This product is also greatly suitable for animal feed packaging which can prevent odor leaking out.